eCite - Radio observations of the Horologium-Reticulum supercluster - I. A3158: excess star-forming galaxies in a merging cluster? Radio observations of the Horologium-Reticulum supercluster - I. A3158: excess star-forming galaxies in a merging cluster? We present 1.4- and 2.5-GHz Australia Telescope Compact Array (ATCA) observations of the galaxy cluster A3158 (z= 0.0597) which is located within the central part of the Horologium-Reticulum supercluster (HRS). Spectroscopic data for the central part of the HRS suggest that A3158 is in a dynamically important position within the supercluster and that it is moving toward the double cluster system A3125/A3128 which marks the centre of the HRS. A total of 110 radio galaxies are detected in a 35-arcmin radius about the cluster at 1.4 GHz, of which 30 are also detected at 2.5 GHz. We examine the source counts and compute the radio luminosity function (RLF) at 1.4 GHz from the subset of 88 sources found within the full-width half-power area of the ATCA beam. Comparison of the source counts in the area over the background, as computed by Prandoni et al., shows some evidence of an excess of galaxies with L1.4 GHz¡Â 2 ¡¿ 1022 W Hz−1 . This result seems to indicate a star-forming population and is a result similar to that found recently by Owen et al. for the merging cluster A2125. 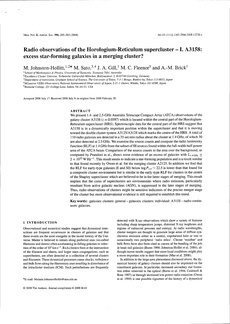 In addition we find that the RLF for early-type galaxies (E and S0) below log P1.4¡­ 22.5 is lower than that found for a composite cluster environment but is similar to the early-type RLF for clusters in the centre of the Shapley supercluster which are believed to be in the latter stages of merging. This result implies that the cores of superclusters are environments where radio emission, particularly resultant from active galactic nucleus (AGN), is suppressed in the later stages of merging. Thus, radio observations of clusters might be sensitive indicators of the precise merger stage of the cluster but more observational evidence is still required to establish this trend.